If you called the office of The Bensman Group on the afternoon of December 4, the chances are that you got a recording saying the person you were trying to reach was out of the office. But it was not some instance of mass hooky-playing. Instead, about 25 Bensman employees spent their afternoon as volunteers for Northern Illinois Food Bank at their facility in Park City, Illinois. The effort began because the company wanted to do something concrete to help people struggling during the holidays in these difficult economic times. Company management decided to schedule the volunteer work during regular office hours, rather than asking employees to sacrifice personal time at this very busy season. Chief Operating Officer Joel Feiger and Tim Maurer, Managing Director of Commercial Insurance, spearheaded the effort to identify a charity. After doing some research, they decided to visit the Northern Illinois Food Bank, which is headquartered in St. Charles, to see how we could help. Joel and Tim met with Tia Milne, the Volunteer Manager at the Northern Illinois Food Bank (NIFB). Tia explained that NIFB is a non-political, non-profit effort that has been feeding the hungry since 1983. In Fiscal Year 2009, the NIFB distributed more than 27.2 million pounds of food in 13 northern Illinois counties. They are on track to distribute more than 36 million pounds this fiscal year! Joel and Tim were impressed with the dedication of Tia and her staff, and with her willingness to work with Bensman to create a volunteer experience in which everyone could participate as part of a team. 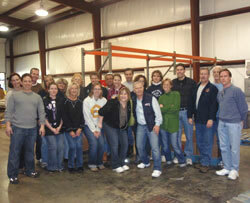 On the designated Friday afternoon, the Bensman volunteers showed up at the NIFB warehouse. Our first job was to get rid of three pallets of bananas that were a little too far past their prime. But our primary job was to separate and re-package meat. The warehouse had received a shipment of donated meat, and we were asked to separate the meat into varieties, re-pack boxes for distribution, and then stack the boxes on pallets. In all, we processed about 8,000 pounds of meat. We left the warehouse that afternoon, tired but glad that we had had the opportunity to do something to help those who need it most. If you are interested in finding out more about helping the Northern Illinois Food Bank, you can visit them online. If you have questions about volunteering, you can contact Tia Milne at Northern Illinois Food Bank, 600 Industrial Drive, St. Charles, IL 60174; 630.443.6910, Ext. 130; tmilne@northernilfoodbank.org. And from all of us here at The Bensman Group, Happy Holidays to you and yours.